Coins4Favors will disrupt the global market for small favors and mini-jobs around the world. We offer a blockchain powered, location aware smartphone app enabled platform that helps to identify and hire people anywhere in the world to provide a small favor or mini-job to you or allow you to earn FavorCoins by providing favors to others. The Coins4Favor system will appreciate in value with every user joining the platform, as it increases the chances to find remote service providers. Use of the integrated rating system allows to ensure the quality of favor requestor and provider from both sides prior to agreeing on a deal. An integrated escrow function ensures favor requests will get paid for by the person asking for the favor and a juror system will help to resolve any disputes over provided services. Help us spread the word and earn 5000 FavorCoins in our brand new Coins4Favors Bounty Program. This will allow you to get whitelisted for our Pre-ICO and ICO program and also allow you to participate in our Bounty Program. You will automatically receive a confirmation email to verify your email address. 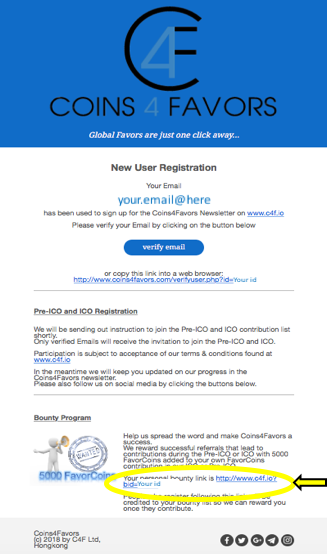 This email already includes your personal bounty program link as shown on the left in the yellow circle. Use your personal bounty program link and post it in your social community (or use a service like https://bitly.com to shorten the URL further), or use it in articles or your signature on discussion forums in Reddit, Bitcointalk, etc. 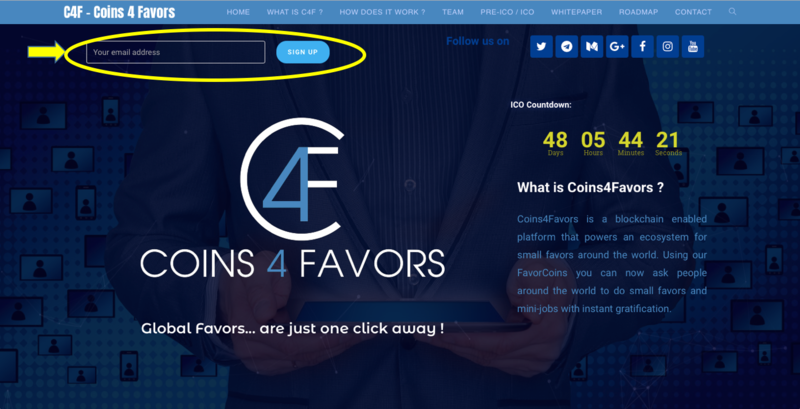 For every friend or other social community members following your link to our Coins4Favors webpage, a cookie will be placed which is valid for 30 days indicating that they have been referred to us via your bounty link. Every signup that happens as a consequence of your referral within these 30 days will have your unique Coins4Favors BountyID linked to the signup. Upon contribution of the new member to our Pre-ICO or ICO you will be credited an extra 5000 Favorcoins which will be paid on top of your contribution to our Pre-ICO and ICO.